There were some olives in the fridge that needed eating up; some capers and lots of tomatoes, so the obvious choice for supper last night seemed to be pasta with a ‘puttanesca’ sauce. 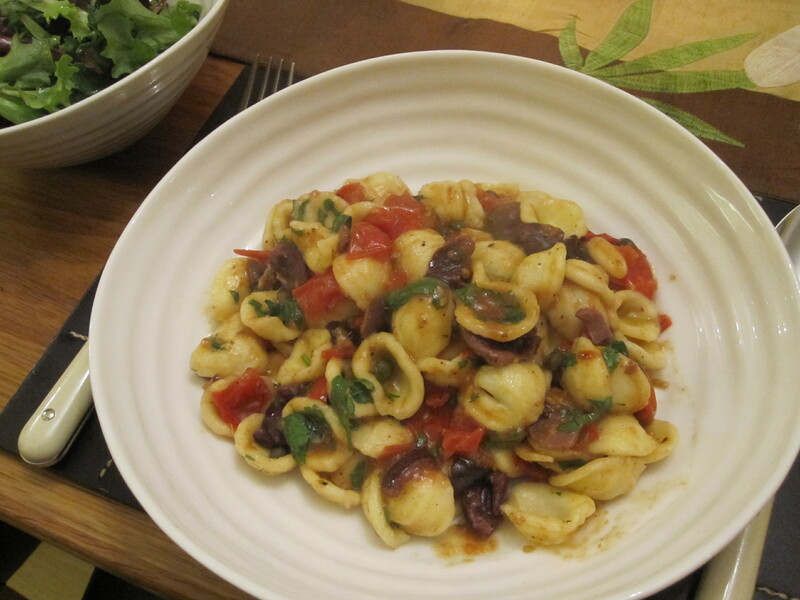 Traditionally, puttanesca sauce is served with spaghetti, but I didn’t have any, and I love the way those orecchiette – ear-shaped pasta – from Puglia capture sauce within their little bowls, so that was where I was heading. As I tend to when cooking and writing for the blog, I got out a number of cookery books and prowled the internet. One book on my shelves, and one I hadn’t had out for ages, was Fred Plotkin’s Italy for the Gourmet Traveler (first published UK in 1997 by Kyle Cathie). This is a wonderful book in which Plotkin leads you to the best restaurants, trattorias, markets, food shops and coffee shops in every part of Italy, and gives you the cultural background and history to the food and wine as well. The book is divided into each region of Italy and uniquely – unlike most guides – Plotkin visits all the places himself. I have a 2003 edition but there was a new one in 2010 and you can find out more via Plotkin’s website link (given above) and get updates. Anyway, Plotkin confirms that puttanesca sauce literally means, ‘in the style of the prostitute’ and tells us that it’s thought the name derived from it being a tasty dish a prostitute could make quickly between clients. Maybe I’ll add at this stage that I put this together in a leisurely manner last night, a glass of Puglian Primitivo to hand, before settling down with just the cat to watch the ‘chocolate’ episode of Heston Blumenthal’s How to Cook Like Heston! Puttanesca sauce comes from the region of Italy that lies between Rome and Naples. 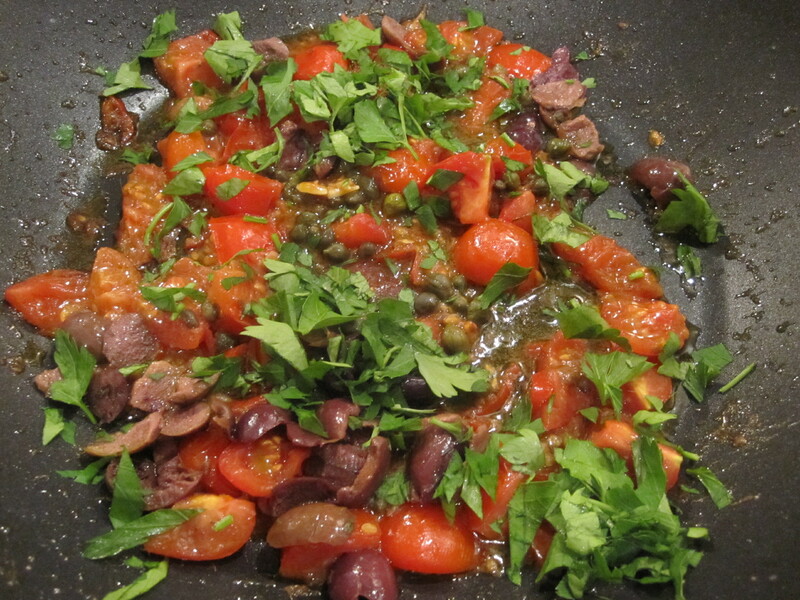 Like that region, the sauce is a gutsy, fiesty mix of strong flavours: garlic, chilli, capers, tomatoes, anchovies and olives. 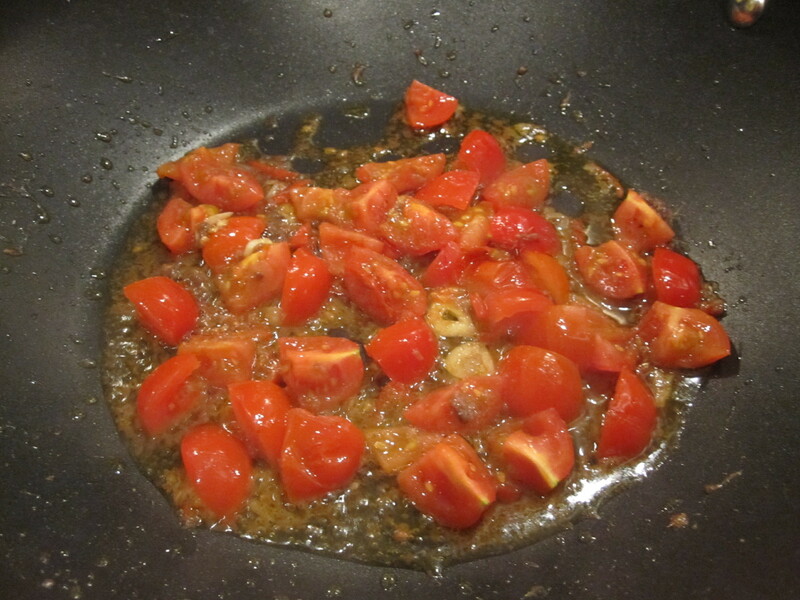 It’s almost a store cupboard dish – most of the ingredients can easily be stored and although I used fresh tomatoes, you could use a tin if that’s all you had. I ate it with a simple side green salad … and some more of that delicious Primitivo wine. This really is a very quick dish to put together so gather all your ingredients and have them prepared before you get going. 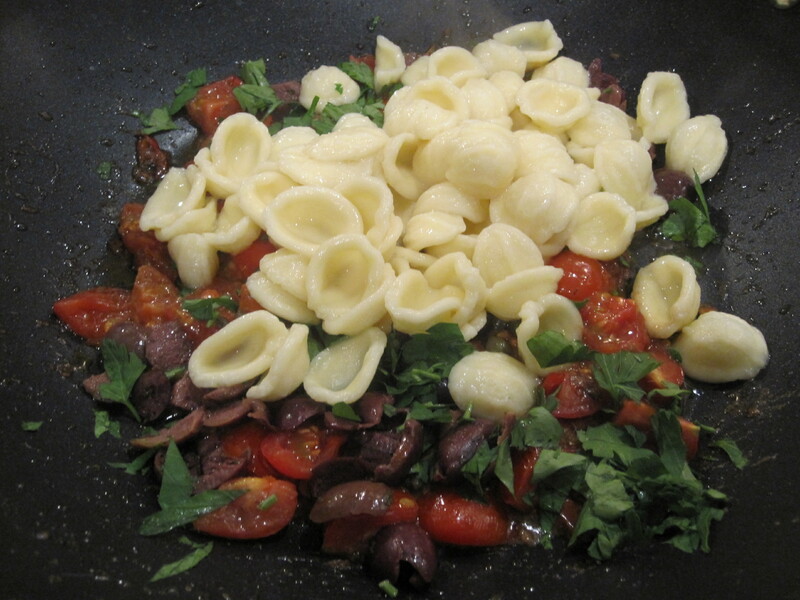 As I used orecchiette pasta, made from durum wheat flour, it was going to take a while to cook – 13-15 minutes – so I got it on the go, dropping the pasta shapes into boiling salted water, straight away. If the pasta is ready a bit before the sauce, it doesn’t matter as you’re going to fold it into the hot sauce. I was cooking just for myself (about 100g pasta), but the quantities are all easily grown to fit the number of people you are feeding. And remember the quantities for everything can be changed to suit your taste. I looked at a number of recipes (Delia, Nigel, Jamie et al) and they are all a bit different – but they all have the same basic ingredients. Remember to just keep tasting and get the dish just how you like it. Slice 1 clove garlic, finely chop 1/2 fresh red chilli (or use dried chilli flakes); wash the excess salt from 4 anchovy fillets and chop them, and chop some stoned black olives till you have about 2 tablespoons. I always buy olives with stones as they taste better than the stoneless ones … but, note to myself, I must buy myself an olive stoner! Wash the brine from 2 teaspoons capers. Roughly chop about 150g tomatoes. I had baby plum ones so chose not to skin them, but if you use large tomatoes, it would be a good idea to skin them first. 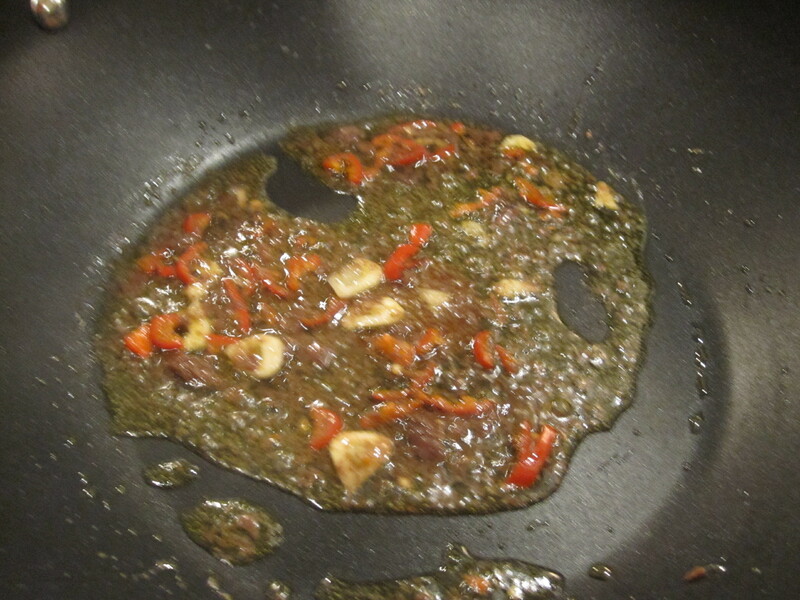 Now, put 2 tablespoon olive oil in a pan and then gently fry the garlic, chilli and anchovies. 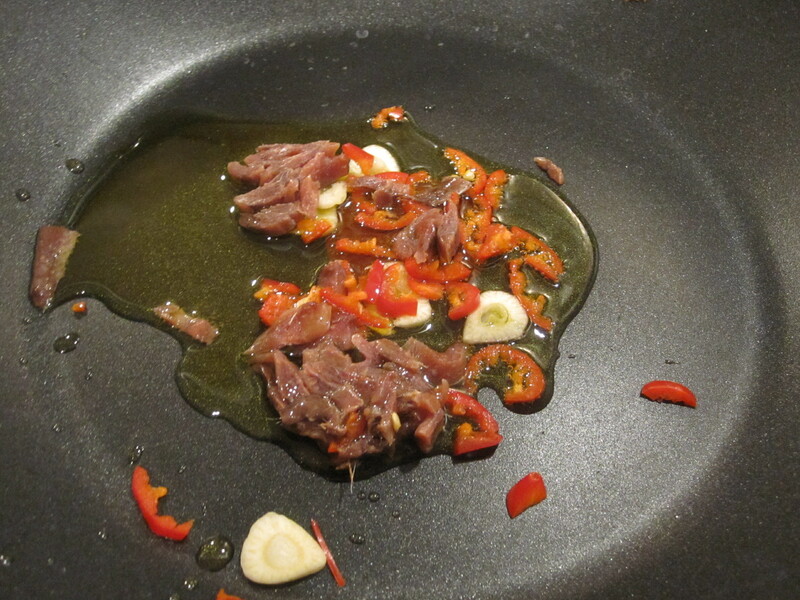 Mash the anchovies down a bit, so you start to create a sauce. Now turn the heat up a little and add the chopped tomatoes and stir, cooking for about 10 minutes until the tomatoes start to soften. I prefer to leave them slightly underdone but you may prefer to cook them down to a pulp. 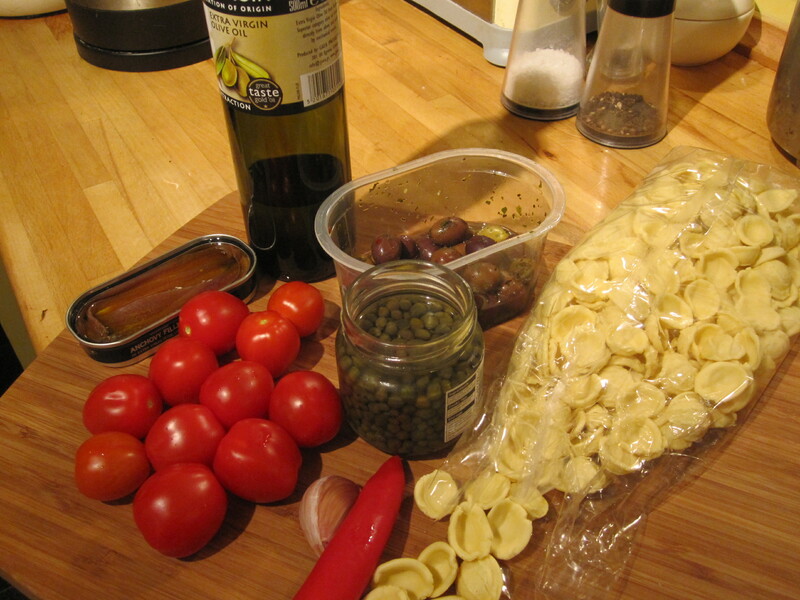 Now, at the last moment, add the chopped olives, capers and a couple of tablespoons fresh chopped parsley. Stir and taste. Add some freshly ground black pepper but you may not need salt because of the residual salt from the anchovies and capers. Then put the cooked pasta into the pan. Gently fold everything together and serve. It’s a wonderful, bold dish full of fieiry, big flavours. Don’t be tempted to add Parmesan – there’s a Brit way of thinking that Parmesan cheese goes with every pasta dish, but it doesn’t.